Months – possibly years – before my mother passed away, I had hounded her for my grandmother’s chocolate marshmallow squares recipe. More brownie than cookie, but definitely not either, chocolate marshmallow squares are studded with walnuts, drifts of marshmallow and glazed with even more chocolate. I can barely contain myself reading my mother’s recipe, thinking of eating those little squares after all this time. It’s been so long since I’ve eaten one that I thought I had imagined them. Google searches proved fruitless – no recipe I read came close to this morsel of goodness. 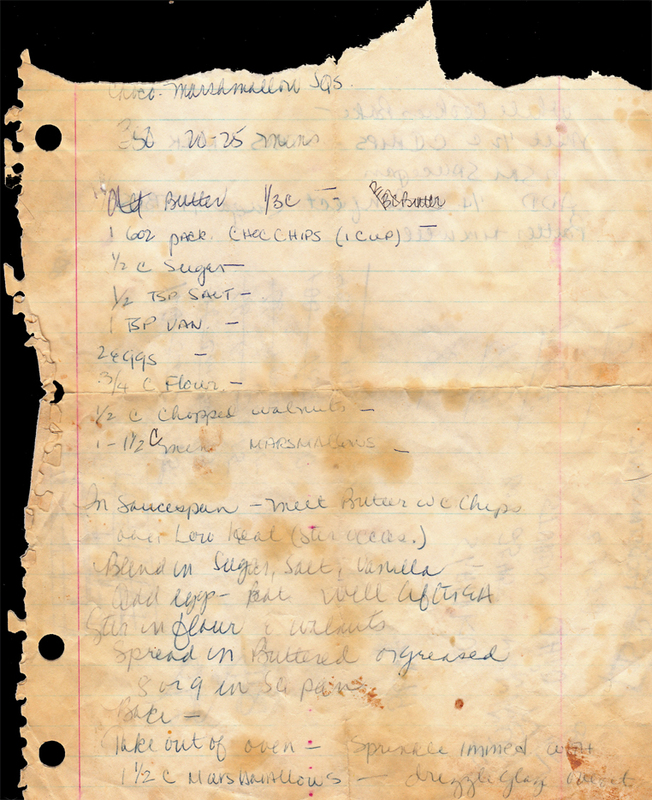 But this past weekend while organizing more of my mother’s papers, I found it – on a yellow scrap of notebook paper, letters fading – the recipe. I remembered the phone calls where she promised to get me the recipe, but she’d have to find it first; the afternoons I visited and found her digging through those same scraps of ephemera: it’s gotta be somewhere around here. It had been there all those years among the other recipes written on envelopes, the backs of greeting cards, on even tinier scraps of paper. I am half-tempted to cook a chicken recipe she recorded, not knowing what I will be eating since there is no title to guide my palate – a surprise dinner from my mother, who liked the comforts of cooking more than cooking the dish itself, much like my relationship with food. But this Sunday, you’ll find me in the kitchen, melting butter with chocolate and sneaking maraschino cherries for a taste of a childhood memory. In a saucepan, melt butter with chocolate chips over low heat, stirring occasionally. Blend in sugar, salt, vanilla and eggs till a batter forms. Stir in flour and walnuts. Spread in greased 8 x 8 inch square pan. Bake for 20-25 minutes. Melt 1/2 cup chocolate chips and 3 tablespoons of milk in small saucepan. Add 1/4 cup confectioners’ sugar and 1 tablespoon butter. Mix well. Once the chocolate marshmallow squares finish baking, sprinkle immediately with the mini marshmallows and drizzle glaze. If you want to make it fancy, add a maraschino cherry to each cut square. It’s wonderful you finally found this, and thanks for sharing it with us. Hope you get your wish of having them baked for you this weekend! thanks, and you’re welcome! this weekend has prevented me from doing some baking, but it will happen soon (oh yes). Glad you found this! I’ve heard you talking about them for years and now I’ll finally know why! It’ll be especially awesome when you bake them for me this weekend (he he).